I was at a money changer at Heathrow, and saw a tariff card, for purchase and sale of a few currencies (all to the GBP). (This was a while ago: It was on 12 May 2011). This makes you think: What countries land up in this display, and how bad are the spreads? It's useful to express these spreads as 100*(offer-bid)/(0.5*(bid+offer)). Let's start with the tightest spreads: USD and EUR. The spread -- 19.98% for the Euro and 20.87% for the USD -- is a pretty huge one compared with the incredible transaction efficiencies that we're used to seeing on NSE and BSE. And, there is an additional charge of min(1.5%, GBP 3) charge. This is a very inefficient consumer front-end, atleast compared to what we have seen is possible in the Indian exchange industry. Where is this spread coming from? The bid/offer spread on the wholesale market for the USD/GBP and the EUR/GBP is roughly zero. The inventory risk carried by the money changing firm must also be quite low given that many customers are likely to come by with such orders with both buy and sell traffic. The USD/GBP is a floating rate, which imposes price risk on inventory, but the inventory is likely to be small, and it's not hard for the firm to lay off this risk in realtime using an automated order placement strategy on a currency futures exchange. Hence, the values of the spread seen there primarily represent the pure cost of the retail front-end : paying rent, paying salaries, the cost of capital etc. The lowest value seen -- a spread of 19.98% for the EUR/GBP -- should be interpreted as the frontier. This reflects pure order processing costs. Every other currency fares worse than this. It's hence interesting to subtract out this lowest value, and try to understand how far the various currencies are from the frontier. Japan and Australia are floating rates with full convertibility. There is no illegality involved. But the inventory risk is greater given that these are smaller countries; there would be fewer buyers/sellers of their currencies to the GBP. The vol is much like GBP/USD or GBP/EUR, so the enhanced spread reflects purely the greater inventory risk. It may also be the case that currency hedging is harder -- is there an exchange where you can have an algorithm placing orders for GBP/AUD? I doubt it. Saudi Arabia and UAE have credible hard pegs to the USD. Their vol to the GBP is exactly the vol of the USD to the GBP. (And, they are as convertible as the US). But their spreads are much bigger than that seen for the USD. It must reflect a small number of transactions and hence inventory risk. They are small countries and few transactions would be taking place. Many of their nationals would probably hold the bulk of their liquid wealth in USD so the question of transacting through the local currency might not even arise. Russia has full capital account convertibility, so there is no illegality. But it's a highly volatile currency, hedging is likely to be hard, and the transaction flow is small. So we get the next step up in the spread, to 6.18%. China has near-zero volatility to the USD, which means they are a high volatility rate to the GBP. GBP/USD is a fair proxy for hedging GBP/CNY. It is a big country so there must be quite a bit of traffic; there would be low inventory risk. The real issue is the illegality. The enhanced spread is the price paid by people undertaking these transactions, for the capital controls of China. And then we have India, the fattest spread in this group of countries, where I reckon it's a combination of illegality (akin to China), low volume of transactions (since India is a much smaller economy than China) and currency volatility (since India floats while China does not). INR/GBP currency futures trading through an algorithm is not available to a global firm, since they are prohibited from sending orders into India. I wasn't able to make any sense of the list of countries that showed up in the list. Why Kenya and Sri Lanka, and why not Nigeria or Indonesia? Surprised by absence of Bangladesh & Pakistan from immigrant. Depends where the picture was taken. In south hall common to see signs on shops "accept indian pakistani rupees"
Yes, the list of countries on the board (this was inside Heathrow) surely reflects the number of tourists. But it also reflects the Pr(transaction|footfall). E.g. 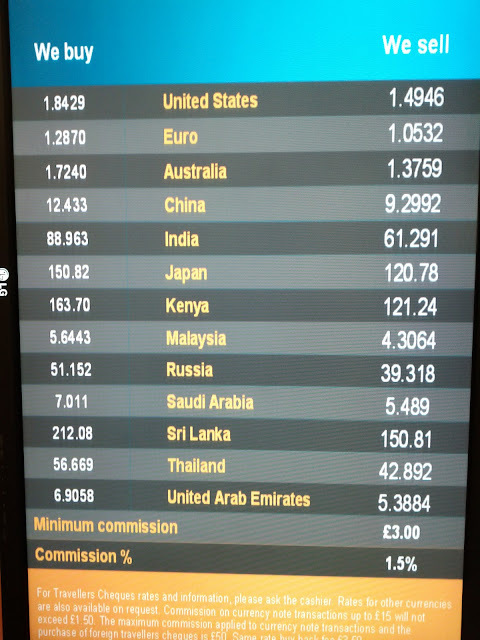 I'm sure there many tourists from UAE who pass through Heathrow, who never do money-changing against the Dirham, because the native locale of their personal finance is the US dollar. These customers would generate USD-GBP transactions and not AED-GBP transactions. I think this is perfect competition, that any fat gets competed away. Are there entry barriers that you can discern? Most travelers can simply withdraw currency from their ATMs (most airports have these) or buy currency before embarking on travel or simply pay with their credit cards in transactions, thus not needing to buy or sell foreign currency at all...all of these options would give you better rates than posted on this screen. The currency exchanges at airports mostly cater to people who are out of the other, better options and hence probably face a more inelastic demand curve. Reminds me of the time during Operation Desert Storm when the bar at Bombay airport would not accept my cash Saudi Riyals as payement for the beer that I ordered. I guess the operators do not want to be left holding currencies with a high beta. Did you consider the huge cost of running this place inside Heathrow? Forex shops in London offer lower spreads than the ones inside Aiports do. THE SPREADS ARE HIGH SINCE THE ENTRY COST TO HAVE THIS BOOTH AT ANY AIRPORT MUST BE HIGH. YOU GET A CAPTIVE CLIENT. OUTSIDE THE AIRPORTS IN ANY COUNTRY THE RATES ARE MORE REALISTIC.